There’s something about marinating meat that gets me excited. It’s such an easy way to impart a lot of flavor, and usually you can do the majority of the work in advance. It’s so nice to know that all I have left to do for dinner is to pop it in the oven. Like most New Yorkers, we are sorely lacking a grill (yet another thing that tops my “dreams of suburbia” list), so this is a great replacement recipe for when you would normally do bbq chicken. The flavor penetrates all the way through the meat, but isn’t overpowering, making this recipe pretty fool-proof for most palates (including children). The meat is also super tender, practically falling off the bone. You could easily set the chicken under the broiler for the last few minutes to give the skin a few charred bits if that’s more your speed as well. I served it with some fresh heirloom tomatoes and corn. A simple and fresh tasting summer dinner. Hope you enjoy! Mix together Worcestershire sauce, ketchup, mustard, ground ginger, apricot jam, and chopped onion. Add chicken and marinade overnight in the refrigerator. Put oil in a rimmed baking sheet, and tilt so that the oil covers the pan. Arrange chicken snugly in pan then top with any remaining marinade. Cook for 45 minutes – 1 hour, turning at least once. 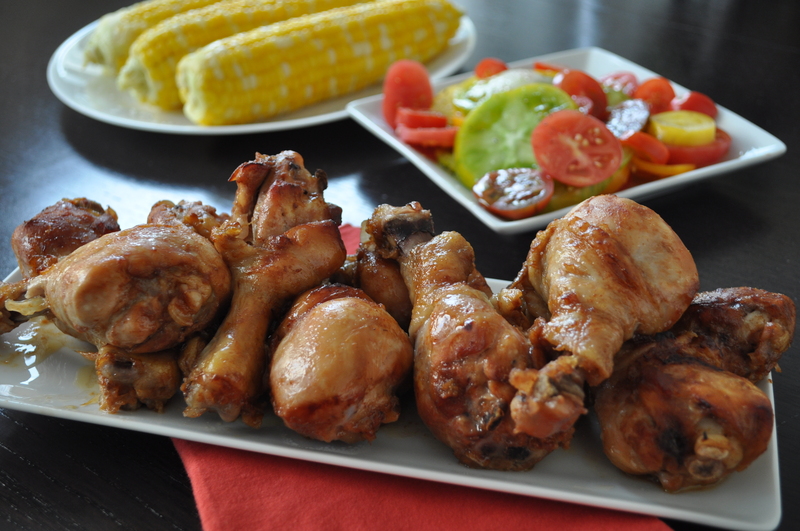 Posted in Dinner, Recipes and tagged chicken, marinade. Bookmark the permalink. This is a great recipe. They really tasted good. Thanks for sharing.